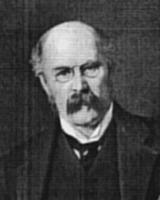 OSLER, FEATHERSTONE LAKE, Church of England clergyman; b. 14 Dec. 1805 in Falmouth, England, son of Edward Osler and Mary Paddy; m. 6 Feb. 1837 Ellen Free Pickton in Budock Water, England, and they had six sons, including Britton Bath*, Edmund Boyd*, and William*, and three daughters; d. 16 Feb. 1895 in Toronto. Of a shipowning family, Featherstone Lake Osler spent most of his time from 1821 to 1832 at sea, first in merchantmen and then in the Royal Navy. His letters of this period contain little about religion but much about naval etiquette and Latin American beauties. Friends on whom he had counted to further his naval career were out of official favour by 1832. They remained influential in evangelical circles in the Church of England, however, and Osler was persuaded to study at Cambridge for holy orders. Having graduated with a ba in 1837, he was awarded an ma in 1843. In 1834 some of Osler’s influential friends had taken the first steps towards the organization of the Upper Canada Clergy Society, and Osler’s experience marked him as a likely prospect for a pioneer mission in that province. His first thought had been of a comfortable living in England, and it was with some reluctance that he accepted appointment to Tecumseth and West Gwillimbury townships. In 1837, after ordination successively as deacon and priest, he took up his post. He more than justified the society’s expectations. Besides securing the necessary facilities for his own parish, Osler travelled widely through adjacent areas conducting services and encouraging church building. By the end of his 20-year tenure he claimed to have begun 28 congregations and as many Sunday schools. He also organized a lending library, distributed religious tracts on every possible occasion, and served as an inspector of schools. His most ambitious undertaking was an informal school, located at Bond Head, for the preparation of “Bush Clergymen” to relieve him of his outlying stations. By the mid 1840s, despite being generally admired for his achievements, Osler was discouraged by what he regarded as a lack of support from Bishop John Strachan* of Toronto. He complained when Strachan diverted some of his graduates to other parts of the diocese. He also resented Strachan’s preference for the theological college opened by Alexander Neil Bethune* at Cobourg in 1842, especially since he regarded Bethune as tainted with “the errors of the Oxford heresy” and Strachan as a “dry morality preacher.” On several occasions he hinted at a possible return to England, but he relented when relieved of West Gwillimbury in 1851. 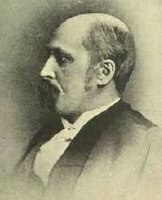 Concerned for his health and for the education of his children, however, Osler applied for a less arduous posting and in 1857 became rector of Ancaster and Dundas, replacing William McMurray. Here he continued his aggressive policy of retiring debt and adding to church facilities. Unfortunately his naval habit of assuming command provoked resentment, especially at Ancaster where a dispute in 1868 over arrangements for a new church building led to the virtual severance of his connection with that part of the parish. In 1882 he retired to Toronto. Osler had become rural dean of Simcoe in 1849, of Wellington (with Halton) in 1867, and of North Wentworth and Halton in 1875. In 1883 he was named a canon of Christ’s Church Cathedral, Hamilton. In Osler’s personality a self-assurance that occasionally bordered on arrogance was tempered by a transparent desire for the welfare of others. If evangelical convictions compelled him to deny the sacraments even to dying parishioners who could not make a credible profession of faith in Christ, he was a convivial host and agreeable companion. Throughout his career an effective pastor and administrator, he is chiefly remembered as a heroic and inventive pioneer missionary and, with Ellen, as the founder of a family of unusual prominence. ACC, Diocese of Toronto Arch., R. W. Allen papers, 34, R. W. Allen, “Notes on the county of Simcoe” (typescript, 1945); F. L. Osler file; “Parish of Tecumseth, 150th anniversary, 1833–1983”; St John’s Church (Tecumseth Township), docs. concerning transfers of property; vestry minutes and accounts; Trinity Church (Tecumseth Township), vestry minutes and accounts; General Synod Arch. (Toronto), M 69-1 (F. L. Osler papers); H. B. Osler, “Early history, Lloydtown parish” (printed brochure, [Toronto], 1900). AO, MS 35, letter-books, 1839–43, 1839–66, 1844–49; MU 2291–305. NA, MG 17, B1, C/Que. and U.C., box IVA/41, folder 492; C/Tor., box IV/42, folder 508; X.7, esp. reports of 1839–40; X.8; X.156 (mfm.). Records of the lives of Ellen Free Pickton and Featherstone Lake Osler ([Oxford], 1915). Church of England Magazine (London), 27 July 1839. Globe, 18 Feb. 1895. Prominent men of Canada . . . , ed. G. M. Adam (Toronto, 1892), 393–94. W. P. Bull, From Strachan to Owen: how the Church of England was planted and tended in British North America (Toronto, 1937). W. A. Craick, A short sketch of the Osler family, 1837–1913 (Toronto, 1938); reprinted from Maclean’s (Toronto), March 1913. [This source is mentioned only because of its unreliability. j.w.g.] T. D. J. Farmer, A history of the parish of St. John’s Church, Ancaster, with many biographical sketches . . . (Guelph, Ont., 1924). 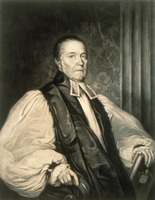 J. L. H. Henderson, “John Strachan as bishop, 1839–1867” (dd thesis, ACC, General Synod of Canada, Toronto, 1955). Adelaide Leitch, Into the high country: the story of Dufferin, the last 12,000 years to 1974 ([Orangeville, Ont. ], 1975). A. C. [Boyd] Wilkinson, Lions in the way: a discursive history of the Oslers (Toronto, 1956). Anglican (Toronto), 26 (1983), no.6: 5. Mrs W. T. Hallam [L. G. Best], “Notes on the life of Canon Featherstone Lake Osler, and his wife, Ellen Free Pickton,” Women’s Canadian Hist. Soc. of Toronto, Trans., no.21 (1920–21): 26–33. John Webster Grant, “OSLER, FEATHERSTONE LAKE,” in Dictionary of Canadian Biography, vol. 12, University of Toronto/Université Laval, 2003–, accessed April 19, 2019, http://www.biographi.ca/en/bio/osler_featherstone_lake_12E.html.